Kevin and His Dogs - Images Are All Online! 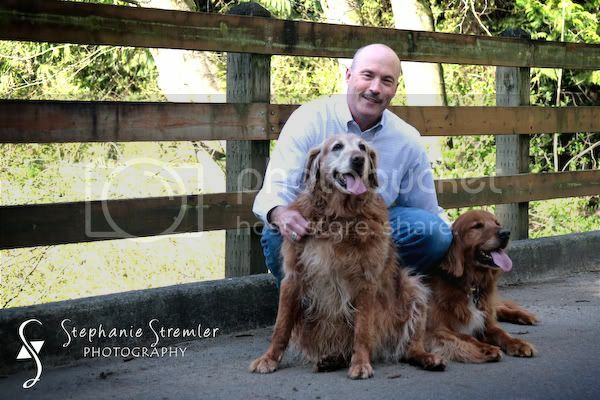 Take a peak at all of the great photographs captured of Kevin and his two adorable goldens! Thanks again Kevin and Bev for such a wonderful time! The photographs will be hosted online for 60 days and any prints ordered within the first seven days will be 10% off the regular price! You can also click in the Online Ordering link above to view the images. Enjoy your week--I'm heading back into the living room to continue to scrape off the popcorn ceiling, which I'm actually finding somewhat fun...pictures of the remodel will be coming soon! Here is one more of my favorite images from the photo session. I love this bridge!